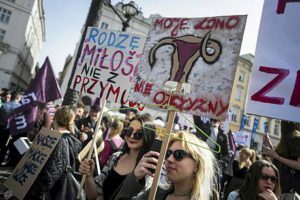 Home › Global Health › “Stop Abortion” in Poland: Is the Polish Legislation to Become Even More Restrictive? “Stop Abortion” in Poland: Is the Polish Legislation to Become Even More Restrictive? This post is by Katarzyna Wazynska-Finck is a PhD candidate in the Law Department, European University Institute. The legal regulation of access to termination of pregnancy currently in force in Poland is one of the most repressive in Europe. Abortion care is legal only in three cases: when there is a threat to life or health of the pregnant woman, when the pregnancy results from criminal offence, and in case of serious and irreversible foetal abnormality or incurable illness (the last case is often referred to in Poland as ‘eugenic’ abortion). This legislation dates back to 1993 and is often referred to as ‘the Compromise’: a middle ground between a total ban (called for by some Catholic groups) and the availability on demand (which was the state of law under the communist regime). However, this compromise has been problematic from its inception. The access to abortion in the three exception scenarios foreseen in the 1993 law has, in practice, been limited. Doctors refuse to carry out terminations of pregnancy by invoking the right to conscientious objection, or by making it de facto impossible for women to obtain access to abortion care within the time limits prescribed by law. Poland has been condemned for having violated the European Convention on Human Rights because of impediments in access to antenatal screening and lack of procedural guarantees for women seeking legal abortion care. Moreover, the topic of abortion regulation (and its implementation) recurs regularly in political debates and numerous attempts have been made both to liberalise and restrict the regulation but remained unsuccessful. In 2016 a bill prepared by a conservative Catholic legal thinktank sought to introduce a total ban on abortion care (including the penalty of up to five years of imprisonment for women having recourse to termination), but was only rejected by Sejm (the lower chamber of the Polish Parliament) only after massive street protests. At the beginning of 2018 Sejm rejected in the first reading a legislative proposal submitted by the Committee ‘Save the Women’, which envisioned the legality of abortion on demand until the 12th week of pregnancy and improved access to sexual education and contraception. At the same session a bill amending the abortion legislation to eliminate foetal abnormality and illness as grounds for legal termination, was approved for further deliberations. The ‘Stop Abortion’ coalition, which introduced the bill as a citizens’ initiative, presents its proposal as a moderate one, only wishing to eliminate ‘eugenic’ abortion, not seeking to punish women or put their life or health at risk. In comparison with the draconian bill rejected in 2016 the current initiative may even be presented as the new ‘compromise’, especially if some concessions are considered, e.g. allowing for termination in case of lethal abnormalities. However, the aim of those behind the bill is clearly indicated in their name: to stop abortion. Currently, abortions carried out due to foetal abnormalities account for the vast majority of legal abortions in Poland (1042 out of 1088 terminations carried out in 2016). Therefore, the erasure of the ‘eugenic exception’ would result in de facto elimination of legal abortion in Poland. And many worry that this time the attempt to amend the regulation may succeed. Firstly, although the bill is a citizens’ initiative, many prominent politicians of the ruling Law and Justice Party have spoken in favour of the amendment. The initiative was also endorsed by the leaders of the Polish Catholic Church, an institution which remains very influential in public life and entertains close ties with the current government. President Andrzej Duda, who has the powers to veto the laws adopted by the Parliament, has declared that the exception to the illegality of abortion, based on foetal condition, is being ‘abused’ in Poland. The Constitutional Court in Poland is competent to assess the compatibility of any law with the Constitution and binding international treaties. The amendment raises serious concerns as to its compatibility with the ECHR, the ICCPR and the CEDAW as interpreted by the relevant treaty bodies. However, too much hope cannot be placed with the Constitutional Court. The Law and Justice government has disregarded the rulings of the Court (including by refusing to publish them in the official journal) and passed legislation with the aim to alter its composition and block its work. Furthermore, the Constitutional Court, when ruling on the legality of abortion on demand in first twelve weeks of pregnancy back in 1997, gave so little consideration to women’s rights while according such a high legal and moral value to the right to life of the ‘unborn child’, that its position may rather be invoked by those campaigning for restriction rather than liberalisation. Human rights campaigners in Poland may only hope that once again social mobilisation and mass protests will act as a deterrent to the ruling Law and Justice Party.